I hope you enjoy my personal website. Please take a look around and check out my website. You will learn all their is to know about me: What I do to pay my bills, my lay ministry serving God, my amateur radio activities, and projects I am currently working on when time permits. Leave me a note on my contact form below if you have a question for me or comment about the site. Attending the quarterly ARRL West Central Florida Section ARES Meeting at the Pasco County EOC. The meeting was well attended. Ben Henley KI4IGX.. Attended the Section ARES Luncheon prior to the Section ARES Meeting at the Pasco County EOC. Thanks to Brooke our wonderful waitress for taking.. I was planning on going out to the big workshop behind the main house (which is 20 by 30 feet large) and build a workbench for my new radio room.. 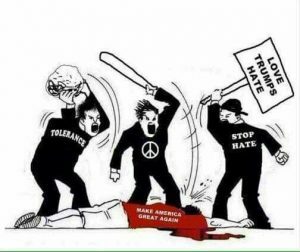 This cartoon I found on Pinterest expresses so well how a percentage of the population of this country says they are tolerant and open minded until you disagree with them.